We were just reminded at a surprise birthday party (pictured above) the ladies gave for Melody (which is not such a surprise anymore, because they do it every year!) that the trials and discouragements of any ministry are offset and outweighed by the joy of seeing the love of brethren who have come to know Christ by the grace of God. They, though imperfect as we are, are truly our glory and joy. 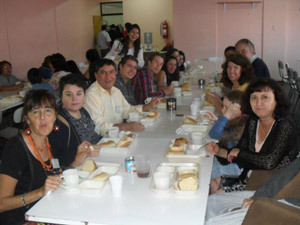 Recently, it was a joy to meet together in Iquique with brethren from our two Arica churches, the Iquique church, Vallenar, Coquimbo, Chillán and Antofagasta for our Easter Congress. Here in the north, the distances are great between the churches. The group from Arica actually had the least distance to travel, about five hours. We thank the Lord for the wonderful fellowship enjoyed with dear believers. One brother from Coquimbo is now working in the mining town of Calama where we know of no fundamental evangelical church. Pray that the Lord would raise up good Bible believing churches in that needy and worldly city. In April, we had the joy of having Mark Ring with us to help in distributing the Bible Story CD’s. We thank all who prayed. 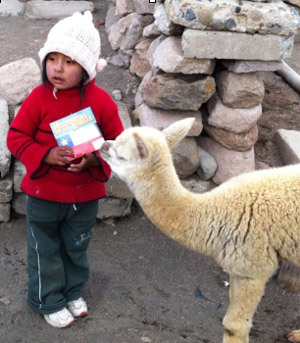 Through the Lord’s leading we were able to get CD’s into many schools in the interior North of Chile. We drove into the Andes Mountains, almost to the Bolivian border and had many opportunities for giving them out. It’s been a joy, too, to see our church people getting excited about giving out the gospel through these CD’s. About 2,500 were handed out in the past two months. Thanks to many of you, our dear supporters, we will be able to buy another 5,000 CD’s to give out in the next few months. The ladies of the two Arica churches hosted a woman’s mini-congress this month, with about 40 ladies participating from Iquique, Chillán, Cabrero, Coihueco, Chile, and La Paz, Bolivia, as well as Arica. Just one note on the women’s ministry here. It was a delight to see Daihana, a young lady from the Dominican Republic, who just received Christ as her Saviour this past year. Not only has she been coming to the ladies’ Bible Study, but she had been even asking to lead the first part one week. Daihana did so and did a wonderful job. It encourages us so much to see her joyful spirit and enthusiasm. We wanted to let you know that Karim Ayala is back with us. She has finished 1 ½ years of study at Pensacola Christian College (PCC). The Lord provided economical flights so that she could come home for her summer vacation and work. Pray that the Lord will provide Karim’s education costs. We would also appreciate your prayers for Karim’s younger sister, Melannie, who has been anxiously awaiting her time to study in a Christian college. She has made application to enter PCC this fall. Please pray that the Lord would provide the funds she needs. It seems overwhelming, because as an international student she (or a sponsor) has to show sufficient funds are available for the entire year (for both her and Karim) and has to be paid up front. God is able. We have seen the miraculous way He provided for Becky this past year. Melannie, like her sister, is a consecrated Christian young lady and will excel in a Christian college. We would appreciate your prayers for her. It is a joy to see this desire to study in a fundamental Christian college. A recent strong tremor woke everyone at 6AM. Some fled their homes for higher ground, but, praise the Lord, there really was no danger or damage. We are thankful for the Lord’s protection and care. Another joy for us is knowing that you all pray for us. We are so thankful that we can present our prayer requests and know that many are praying for those requests and for us. One big answer to prayer is happening right now. The ceiling of our church auditorium is going up this week! We are so thankful to those who gave for this project. It will make the church much nicer, warmer in the winter, and easier to clean since there will no longer be open space between the walls and the roof. Please pray for the mission team planning on coming in July. Our daughter Rebekah as well as two other young ladies, Deborah Faucette and Sara Quintero, will be coming with Gary and Pat Johnson for the first two weeks of July to help with various projects, with evangelization and especially to help in our camp. Please pray for the Lord’s provision of support for each of the team members and that the Lord will greatly bless each of them on the trip. If you would like to contribute to the support for any of the three girls, please send you check to the IBPFM headquarters and indicate which one you are supporting. Please pray for our youth camp to be held July 10-13. There is still much planning and preparation to be done. Pray for the Lord’s provision for camp and for the young teens that will come. We pray this camp will affect their lives for eternity. If you would like to help with the costs of the camp, we would greatly appreciate it. You can sponsor a camper for only $35. Many of the campers cannot pay the actual costs of the camp but we want them to be able to come anyway. July 20-22 our church has been asked to host an international youth congress. When we had this congress here in the year 2000, over 300 young people came! We don’t know how many will come this time, but we need prayers for the preparations, getting a school to use for accommodations, planning meals, etc. All these activities coming up seem a little overwhelming to us. But we thank the Lord for His faithfulness and your prayers on our behalf. We appreciate you all so much. We have seen such an outpouring of love for our daughter Becky, being away at Bob Jones, and we just appreciate it so much. The Lord uses YOU our faithful supporters and prayer warriors to keep us going and to keep His work going forward here in Chile. Thank you so very much. We were glad to hear that God answered our prayers for the safety and success of the S.O.M.E. Team’s efforts; and trust all went well with youth camp too! We’ll be praying for the next BIG event….Youth Conference! We like the new website…and the opportunity to read these updates and respond! May God continue to bless your labors and bring forth fruit for His Glory!